Our understanding of marine ecosystems is strongly influenced by the terrestrial macroscopic world we see around us. For example, the distinction between phytoplankton and zooplankton reflects the very familiar divide between plants and animals. Mixotrophs are organisms that blur this distinction by combining photosynthetic carbon fixation and the uptake of inorganic nutrients with the ingestion of living prey (1). In the macroscopic terrestrial realm, the obvious examples of mixotrophs are the carnivorous plants. These organisms are so well known because they confound the otherwise clear divide between autotrophic plants and heterotrophic animals – in terrestrial environments, mixotrophs are the exception rather than the rule. There appear to be numerous reasons for this dichotomy involving constraints on surface area to volume ratios, the energetic demands of predation, and access to essential nutrients and water. Without dwelling on these aspects of macroscopic terrestrial ecology, it appears that many of the most important constraints are relaxed in aquatic microbial communities. Plankton have no need for the fixed root structures that would prevent motility, and in the three-dimensional fluid environment, they are readily exposed to both inorganic nutrients and prey. In addition, their small size and high surface area to volume ratios increase the potential efficiency of light capture and nutrient uptake. As such, mixotrophy is a common and widely recognised phenomenon in marine ecosystems. It has been identified in a very broad range of planktonic taxa and is found throughout the eukaryotic tree of life. Despite its known prevalence, the potential impacts of mixotrophy on the global cycling of nutrients and carbon are far from clear. In this article, I discuss the ecological niche and biogeochemical role of mixotrophs in marine microbial communities, describing some recent advances and identifying future challenges. Mixotrophy appears to be a very broadly distributed trait, appearing in all marine biomes from the shelf seas (2) to the oligotrophic gyres (3), and from the tropics (4) to the polar oceans (5). Within these environments, mixotrophy is often a highly successful strategy. For example, in the subtropical Atlantic, mixotrophic plankton make up >80% of the pigmented biomass, and are also responsible for 40-95% of grazing on bacteria (3, 4). Similar abundances and impacts have also been observed in coastal regions (2, 6). carbon is limited by the supply of exogenous (or “new”) nutrients (7), since any local regeneration of nutrients from organic matter is also associated with the local remineralisation of dissolved inorganic carbon. Energy and biomass are passed up the food web, but the transfer across trophic levels is highly inefficient (8) (Fig. 1) because the energetic demands of strictly heterotrophic consumers can only be met by catabolic respiration. In the mixotrophic paradigm, several of these constraints are relaxed. Primary production is no longer exclusively dependent on the supply of inorganic nutrients because mixotrophs can support photosynthesis with nutrients derived from their prey. This mechanism takes advantage of the size-structured nature of marine communities (9), with larger organisms avoiding competitive exclusion by eating their smaller and more efficient competitors (10-12). 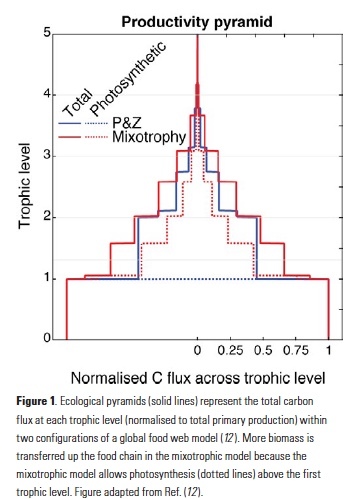 In addition, the energetic demands of mixotrophic consumers can be offset by phototrophy, leading to increased efficiency of carbon transfer through the food web (Fig. 1). These two mechanisms dictate that mixotrophic ecosystems can fix and export more carbon for the same supply of limiting nutrient, relative to an ecosystem strictly divided between autotrophic phytoplankton and heterotrophic zooplankton (12). oligotrophic subtropical gyres, the inorganic nitrogen supply is acquired almost exclusively by the smallest and most competitive phytoplankton (not shown). This leaves an inadequate supply for larger and less competitive phytoplankton, and as such, the larger size classes are dominated by zooplankton (as indicated by the purple shading in Fig. 2a, b). In the more productive polar oceans and upwelling zones, grazing pressure prevents the smaller phytoplankton from exhausting the inorganic nitrogen supply, leaving enough for the larger phytoplankton to thrive in these regions (as indicated by the green shading). The right-hand maps in Fig. 2 show the balance of autotrophic and heterotrophic resource acquisition in the intermediate size-class of an otherwise identical model containing only mixotrophic plankton. 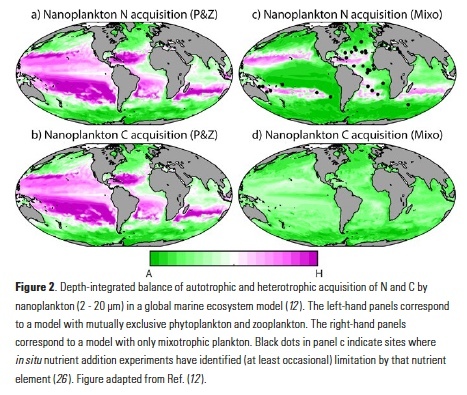 As in the model with mutually exclusive phytoplankton and zooplankton, the inorganic nitrogen supply in the oligotrophic gyres is exhausted by the smallest phytoplankton (see the purple shading in Fig. 2c). However, Fig. 2d indicates that this is not enough to stop photosynthetic carbon fixation among the mixotrophic nanoplankton. The nitrogen acquired from prey is enough to support considerable photosynthesis in a size class for which phototrophy would otherwise be impossible. For the same supply of inorganic nutrients, this additional supply of organic carbon serves to enhance the transfer of energy and biomass through the microbial food web, increasing community carbon:nutrient ratios and leading to as much as a three-fold increase in mean organism size and a 35% increase in vertical carbon flux (12). Marine mixotrophs are broadly distributed across the eukaryotic tree of life (13). The ability to combine photosynthesis with the digestion of prey has been identified in ciliates, cryptophytes, dinoflagellates, foraminifera, radiolarians, and coccolithophores (14). Perhaps the only major group with no identified examples of mixotrophy are the diatoms, which have silica cell walls that may hinder ingestion of prey. While some mixotroph species are conceptually more like plants (that eat), others are more like animals (that photosynthesise). A number of conceptual models have been developed to account for this observed diversity. 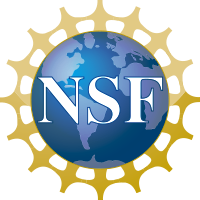 One scheme (15) identified three primarily autotrophic groups that use prey for carbon, nitrogen or trace compounds, and two primarily heterotrophic groups that use photosynthesis to delay starvation or to increase metabolic efficiency. More recently, an alternative classification (16, 17) identified three key groups on a spectrum between strict phototrophy and strict phagotrophy. According to this classification, primarily autotrophic mixotrophs can synthesise and fully regulate their own chloroplasts, whereas more heterotrophic forms must rely on chloroplasts stolen from their prey. Among this latter group, the more specialised species exploit only a limited number of prey species, but can manage and retain stolen chloroplasts for relatively long periods. In contrast, generalist mixotrophs target a much wider range of prey, but any stolen chloroplasts will degrade within a matter of hours or days (18). This diversity of trophic strategies is clearly more than most biogeochemical modellers would be prepared to incorporate into their global models. Nonetheless, many of the conceptual groups identified above are associated with the ability of mixotrophs to rectify the often-imbalanced supply of essential resources in marine ecosystems (19). This is clearly relevant to the coupling of elemental cycles in the ocean, and it appears likely that the relative abundance of different trophic strategies can impact the biogeochemical function of marine communities (1, 20). For example, recent work suggests that a differential temperature sensitivity of autotrophic and heterotrophic processes can push mixotrophic species towards a more heterotrophic metabolism with increasing temperatures (21). An important goal is therefore to accurately quantify and account for the global-scale effects of mixotrophy on the transfer of energy and biomass through the marine food web and the export of carbon into the deep ocean. We also need to assess how these effects might be sensitive to changing environmental conditions in the past, present, and future. These processes are not resolved in most contemporary models of the marine ecosystem, which are often based on the representation of a limited number of discrete plankton functional types (22). In terms of resolving mixotrophy, it is not the case that these models have overlooked the one mixotrophic group. Instead, it may be more accurate to say that the groups already included have been falsely divided between two artificially distinct categories. As such, modelling mixotrophy in marine ecosystems is not just a case of increasing complexity by adding an additional mixotrophic component. Instead, progress can be made by understanding the position, connectivity, and influence of mixotrophic and non-mixotrophic organisms within the food web as an emergent property of their environment, ecology, and known eco-physiological traits. This is not a simple task, but progress might be made by identifying the fundamental traits that underpin the observed diversity of functional groups. To this end, a recurring theme in mixotroph ecology is that plankton exist on a spectrum between strict autotrophy and strict heterotrophy (14, 23, 24). Competition along this spectrum is typically framed in terms of the costs and benefits of different modes of nutrition. Accurate quantification of these costs and benefits should allow for a much clearer understanding of the trade-offs between different mixotrophic strategies (25), and how they are selected in different environments. In the future, a combination of culture experiments, targeted field studies, and mathematical models should help to achieve this goal, such that this important ecological mechanism can be reliably and parsimoniously incorporated into global models of marine ecosystem function. 1. Stoecker, D. K., Hansen, P. J., Caron, D. A. & Mitra, Annual Rev. Marine Sci. 9, forthcoming (2017). 2. Unrein, F., Gasol, J. M., Not, F., Forn, I. & Massana, R. The ISME Journal 8, 164–176 (2013). 3. Zubkov, M. V. & Tarran, G. A. Nature 455, 224–227 (2008). 5. Gast, R. J. et al. J. Phycol. 42, 233–242 (2006). 6. Havskum, H. & Riemann, B. Marine Ecol. Prog. Ser. 137, 251–263 (1996). 7. Dugdale, R. C. & Goering, J. J. Limnol. Oceanogr. 12, 196–206 (1967). 8. Lindeman, R. L. Ecol. 23, 399–417 (1942). 9. Sieburth, J. M., Smetacek, V. & Lenz, J. Limnol. Oceanogr. 23, 1256–1263 (1978). 10. hingstad, T. F., Havskum, H., Garde, K. & Riemann, B. Ecol. 77, 2108–2118 (1996). 11. Våge, S., Castellani, M., Giske, J. & Thingstad, T. F. Aquatic Ecol. 47, 329–347 (2013). 12. Ward, B. A. & Follows, M. J. Proc. Nat. Acad. Sci. 113, 2958–2963 (2016). of both photosynthesis and ingestion), they are undersampled and underappreciated by phytoplankton and zooplankton ecologists alike. Red water has been reported in Long Island Sound on occasion by other observers. While Mesodinium was present in >80% of all samples examined in >10 years of monthly plankton monitoring data, no sample ever exceeded 2.6 x 104 cells l-1. In Fall 2012, Univ. Connecticut personnel servicing a moored array observed and sampled red water in western Long Island Sound (40.9°N 73.6°W). Microscopy and DNA sequencing confirmed that the bloom was due to Mesodinium (100% identical by small subunit rDNA to the larger M. major), and we subsequently reported on our efforts to document the bloom using satellite imagery (8). Here, we summarize those results and discuss the promise of new sensors for quantifying blooms of specific plankton groups by their pigment signatures, especially when coarsely resolved monitoring samples are inadequate. 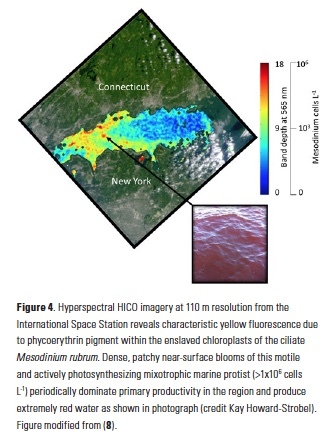 Ocean color satellites provide a means to assess such red tides, but the standard chlorophyll products are inaccurate in the optically complex waters of Long Island Sound, which contain river runoff with colored dissolved organic matter (cDOM) and suspended sediments (9, 10) (Fig 2). Imagery from the MODIS sensor of fluorescence line height (Fig. 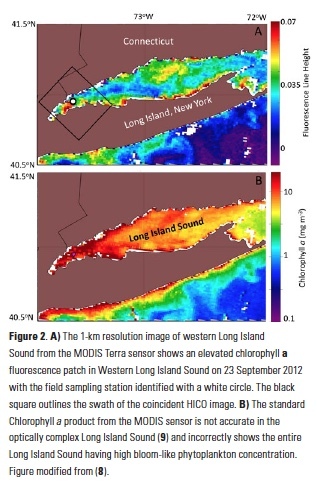 2A) indicated the presence of an unspecified bloom in Western Long Island Sound coincident with the bloom, but the spatial resolution (1-km pixels) did not allow us to gauge the bloom extent adequately, and the spectral bands of that sensor are not sufficient to discriminate the type of bloom. Serendipitously, an image was available for the western Sound from the novel Hyperspectral Imager for the Coastal Ocean (HICO) instrument aboard the International Space Station. This sensor contains >100 channels in the visible and near infrared regions of the spectrum and hence has the capability to resolve multiple peaks and valleys due to fluorescence and absorbance of the chlorophylls and accessory pigments found in various phytoplankton groups. It also has the higher spatial resolution (110-m pixels) needed to quantify the extent of the bloom and variation in ciliate abundance within it. Because the red water we observed appeared (microscopically) to be almost exclusively due to Mesodinium, the HICO reflectance spectrum was an almost pure example of the in situ optical signature of this unique organism (i.e. an “endmember” in remote sensing terminology). In addition to phycoerythrin, the cryptophyte chloroplasts that the ciliate retains contain chlorophyll-a, chlorophyll-c2, phycocyanin, and the carotenoid alloxanthin. 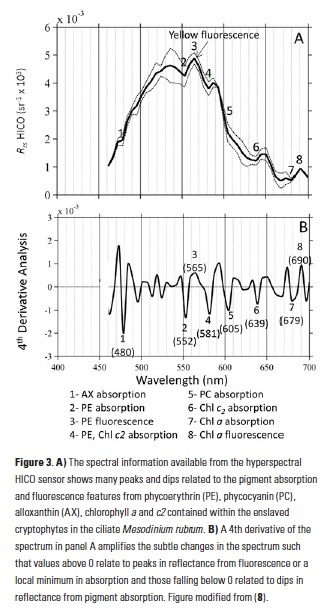 The reflectance spectrum measured with the HICO sensor revealed features related to the fluorescence and absorption associated with these pigments that can be used as a spectral “fingerprint” of this specific organism (Fig. 3A). With reflectance measured across the full visible spectrum, small dips in the spectrum can be revealed with a 4th derivative analysis and related to the associated pigments (11) (Fig. 3B). In addition to absorbing green light, phycoerythrin also fluoresces yellow light (12) (Fig. 1B) and a peak in reflectance was observed at ~565 nm associated with this feature. This unique fluorescence feature allowed us to map the surface distribution of Mesodinium in Long Island Sound. Traditional ocean color satellites do not measure reflectance of light at this waveband, but yellow fluorescence (band depth at 565 nm) could be detected from the hyperspectral measurements of HICO and related to the relative amount of Mesodinium up to the measured 106 cells L-1 with distinctly red colored water (Fig. 4). The fine-scale distribution of the HICO imagery reveals that Mesodinium was found in small 100-m patches along the sea surface rather than distributed throughout a single multi-kilometer patch as suggested by the 1-km MODIS imagery (Fig 2A). Such high spatial resolution from aircraft has been used to assess concentration mechanisms of blooms, including internal waves (13) and Langmuir circulation (14). Further research is underway to assess the observed patterns with hydrographic and air-sea processes local to this region. Understanding the spatial distribution may also lead to a better understanding of the environmental factors that lead to these episodic blooms of Mesodinium. Generally, Mesodinium is more abundant in lower salinity estuarine water, but the causes of bloom initiation and demise are not well known (15). Though now defunct, the HICO sensor should serve as a model for remote sensing in the coastal zone. With its high spectral and spatial resolution, images from HICO could be used to assess coastal processes, as highlighted here, but only at infrequent intervals. While possible with airborne technology, no existing or planned satellite sensor can sample at high spectral, spatial, and temporal resolution for adequate monitoring of the coastal zone. Providing near-daily coverage for much of the globe, the next generation NASA ocean color sensor, Pre-Aerosol, Cloud and ocean Ecosystems (PACE), is slated to have the unique hyperspectral capabilities to allow for better discrimination of marine blooms and habitats, but with a larger km-scale resolution. International sensors with new capabilities will also help to fill this gap (16). 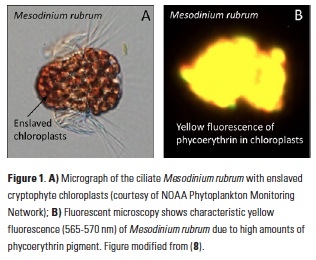 With new hyperspectral technology in space, autonomous and routine differentiation of phyto- and mixotrophic plankton blooms in surface waters may be possible and could provide an important tool for resource managers. Improved monitoring of bloom-forming plankton will also lead to more refined estimates of coastal primary productivity and mechanisms for their episodic growth and decline. If future sensors or sensor constellations combine high repeat sampling with the hyperspectral capabilities and high spatial resolution of HICO, we will be able to understand not only the composition and extent of blooms, but also the sub-mesoscale processes that drive their persistence and spatial structure. We thank Kay Howard-Strobel, Senjie Lin, and the NOAA Phytoplankton Monitoring Network for images of the bloom and of Mesodinium. Dajun Qiu verified the genetic identity of the ciliate. Adam Chlus and Bo-Cai Gao contributed to the image processing. 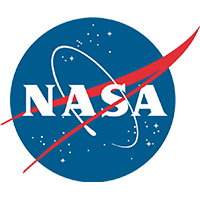 We also thank the HICO Science Team and NASA Ocean Biology Distributed Active Archive Center for providing satellite imagery. Darwin, C., 1909. The Voyage of the Beagle, P.F. Collier. Crawford, D. W., 1989. Mar. Ecol. Prog. Ser. Oldendorf 58, 161–174. Johnson, M. D. et al., 2007. Nature 445, 426–428. Garcia-Cuetos, L. et al., 2012. J. Eukaryot. Microbiol. 59, 374–400. Crawford, D. W., T. Lindholm, 1997. Aquat. Microb. Ecol. 13, 267–274. Taylor, F. J. R. et al., 1971. J. Fish. Board Can. 28, 391–407. Smith, W. O., R. T. Barber, 1979. J. Phycol. 15, 27–33. Dierssen, H. et al., 2015. Proc. Natl. Acad. Sci., doi:10.1073/pnas.1512538112. Aurin, D. A., H. M. Dierssen, 2012. Remote Sens. Environ. 125, 181–197. Aurin, D. A. et al., 2010. J. Geophys. Res. 115, 1–11. Bidigare, R. R. et al., 1989. J. Mar. Res. 47, 323–341. McManus, G. B., J. A. Fuhrman, 1986. J. Plankton Res. 8, 317–327. Ryan, J. P. et al., 2005. Oceanography 18, 246–255. Dierssen, H. M. et al., 2015. Remote Sens. Environ. 167, 247–258. Herfort, L. et al., 2011. Estuar. Coast. Shelf Sci. 95, 440–446.